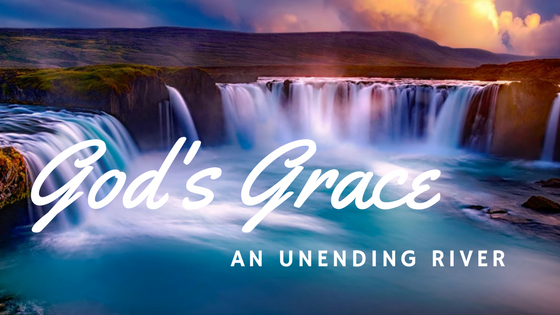 The Grace of God – The River of God’s Grace is Wide! The golden thread of grace flows through scripture like a river wide and deep, sometimes gently moving, often in a torrent. All touched by the river live! “God saved you by his grace when you believed. A wise man reminded me that people “in the ditch” will argue contentiously. When it comes to grace, there has been much ditch walking and arguing. Neither ditch walker is willing to extend tangible grace to the other. The more we platform on a topic, it is usually an indication we ourselves are struggling in that area! God must be wanting to go deeper in my understanding of grace at this moment. Sadly and with regret I remember that I have participated in such argumentative behaviour, dividing and wounding relationships. I have had much to learn about grace over the years; much more remains to master. The essence of the argument beside the road of grace, isn’t grace. Rather, it is a fear of judgment. A plank is nothing to take lightly! A plank in the eye would be clearly visible to others and completely blinding to one possessing it. Rough and unfinished, it quickly inflicts splinters on anyone who would come close enough to touch it. The number of “planks” pulled from these eyes of mine is innumerable. Some have been so enormous it has taken a troop of brave comrades to remove them with and for me. Jesus clearly commands each of us to take full responsibility for our “stuff”, our planks! I must get rid of it! Sawdust is not clearly visible. Yet the damage of sawdust can be severe! Not only will it produce irritation, tearing and inflammation of the mucous membranes, sawdust can also cause infection potentially progressing to the brain. Unlike my planks that have taken a team of heavy lifters to remove, dealing with sawdust requires close contact. By using a mirror or even magnifying glass, in good lighting, one must look on every surface and behind the eyelids themselves. Drenching the eye with exorbitant amounts of water may be necessary. For someone to help me, they need to get into my face and look intently for any offensive particle, before removing it with clear vision, a steady hand and great care. Grace is necessary in the removal of both plank and dust. I need God’s grace working in me and through others to remove the planks from my life. God’s grace is also necessary to remove tiny but painful things. Large or small, in me or others, both can and will cause irreparable damage unless removed. Jesus invites us all to the way of grace. United we make an unbeatable team! Because our gifts are different, grace also will flow differently through each of us. In the Holy Spirit, some demonstrate grace by praying, supporting, blessing, and encouraging the frail along the way. Others, through the Spirit, are vital in getting into comfort zones and shining the light on truth, while gently and with wisdom stepping into lives at a level many would dare never enter. On God’s team, grace flows freely through each one, creating a safe atmosphere of hope and promise for those around us. It is a rainbow of diversity in action that only God could have initiated. His grace allows us to appreciate every diverse form. and his grace to me was not without effect. God’s grace is actively at work, transforming lives and destinies. What joy to watch and be involved in this work of His doing! Further Reading: Grace Notes – The Extras that Matter! Supporting the Melody! If you would like to receive this blog via email, sign up here!